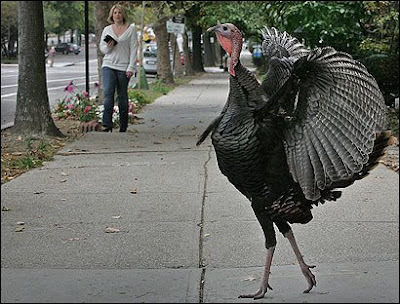 Turkeys are kind of funny looking. Happy Thanksgiving! I have seen wild turkeys, but they ran away from me and I wasn't in the city. I did get a picture of it though. love the turkey pic! happy thanksgiving all! My grandparents live in, like, suburbia and one time, there were wild turkeys walking around in their neighborhood. It was funny and maybe weird for them, but I live in the middle of nowhere and I see turkeys all the time. She had a problem with turkeys? I mean, they're ugly, but that's about it. plaese vist my blog THE LEAVES ARE FALLING OF MY PINE TREE. plaese!!!!!! And that photo is bizarre.